Though a cold slice of pizza is not without charm, pizzeria managers know most consumers enjoy products fresh from the oven. Customers appreciate the taste of piping-hot pizza smothered with melted cheese and sauce, and a diner's impatience may lead to a burned mouth. Pizzerias typically have a display stand on the counter to showcase finished pies to hungry customers, but a slice sitting on a metal sheet can quickly harden. As a result, the stale cheese may lead customers to pursue other eateries. Restaurant equipment can be employed to combat this problem. 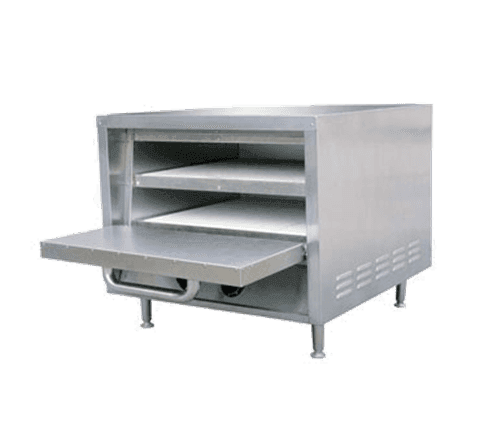 Commercial ovens like the Grindmaster-Cecilware PO22 Countertop Pizza Oven can be positioned on a countertop within easy reach of a cashier. Doing so eliminates any time lost transferring pizza from a display stand to the oven. The internal heating elements ensure even heating throughout a slice so cheese will not drip down the sides. The low price of this product makes it a great choice for pizzerias operating on a limited budget, and the free shipping on ckitchen.com provides an added bonus to cost-conscious managers.